Flower (Yamakawa) Condition: Generally very good condition. Untrimmed full margins. Standard kuchi-e horizontal folds. No tears, and generally no creases. A few scattered foxing spots that are mostly unintrusive. Unbacked, verso clean. See large image below. 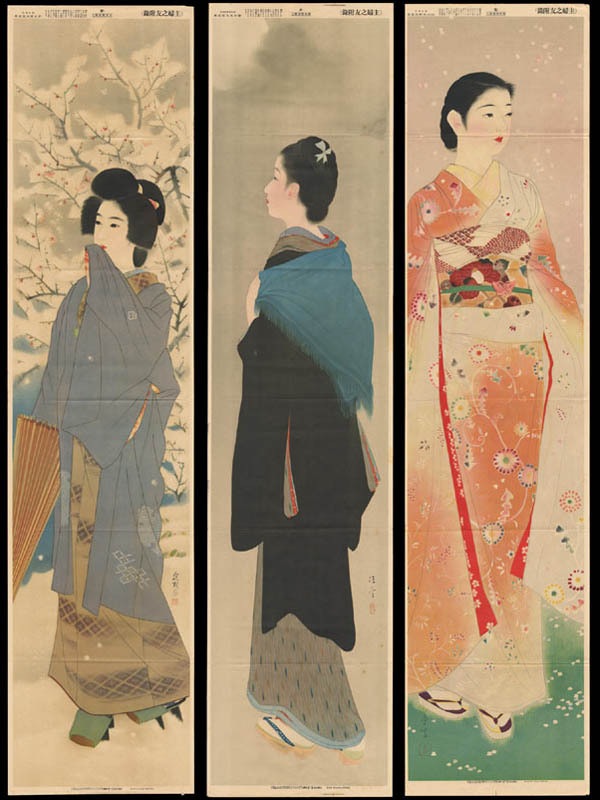 Comments: Rare pre-war machine printing of gorgeous bijin (beauties) by three of Japan's foremost bijin-ga artists - Shinsui, Kiyokata, and Yamakawa. Rarely seen in the market. Very large size - each print being over a metre tall. Titles in the centre of the top margins. Artist signatures and seals within the image areas. Publishing details in bottom margins. This series was printed as a supplement (kuchi-e) to the magazine "Shufu no Tomo" (Housewife's Friend).